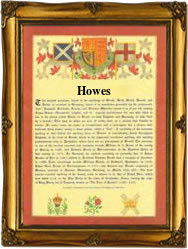 This interesting surname recorded in the spellings of How, Howe, Hoe, Hoo, Heugh, Hough, Hoof, Houf, Houff, Huff, Hughff, and the patronymic Hows, Howes, Howey, Howis, Howison, and no doubt many others, is Anglo-Scottish and medieval in origin. It has at least three possible derivations. The first being a development of the Old French personal name "Hugh", apparently not found in Britain until introduced by the Normans after the 1066 Invasion. Curiously and confusingly 'Hugh' is itself a shortened form of any of the various Germanic compound baptismal names with the first element "Hug" meaning heart, mind or spirit, such as the very English surnames 'Howard', originally 'Hugi-hard', and Hubble, originally 'Hugi-bald'. William Howe, recorded in warwickshire in 1221, clearly came from this source. The second possible origin is from the Old English pre 7th century topographical name for someone who lived by a small hill, or man-made burial mound called a 'hoh'. Bendict de Ho in the pipe rolls of Leicester in 1199, would seem to be a candidate for this section. However to confuse matters further, there are also many villages called Hoe, Hoo, Hough, Hose, and Heugh, to add to the list of potential origins for the surname, and Willian atte Hoo of Kent in 1333, presumably came from the Kent village. Further recordings include William ate Howes in the Subsidy Rolls of Cambridgeshire in 1327 and Elyzabeth, the daughter of William Howes, who was christened at St. Nicholas church, Cole Abbey, London, on February 13th 1542, whilst Elizabeth Howis married Mary Gilbart on August 16th 1557 at St. Matthew's, Friday Street, London. The first recorded spelling of the family name is shown to be that of Marjoria de Howes, which was dated 1211, in the "Curia Rolls of Leicestershire", during the reign of King John, known as "Lackland", 1199 - 1216. Surnames became necessary when governments introduced personal taxation. In England this was known as Poll Tax. Throughout the centuries, surnames in every country have continued to "develop" often leading to astonishing variants of the original spelling.